When planning the 30th anniversary season, La Fiesta Chairs Mary Hubbard and Lori Martin wanted their “¡Celebración!” to be special. They thought what better way to honor our La Fiesta anniversary than to honor the ones who made it possible! 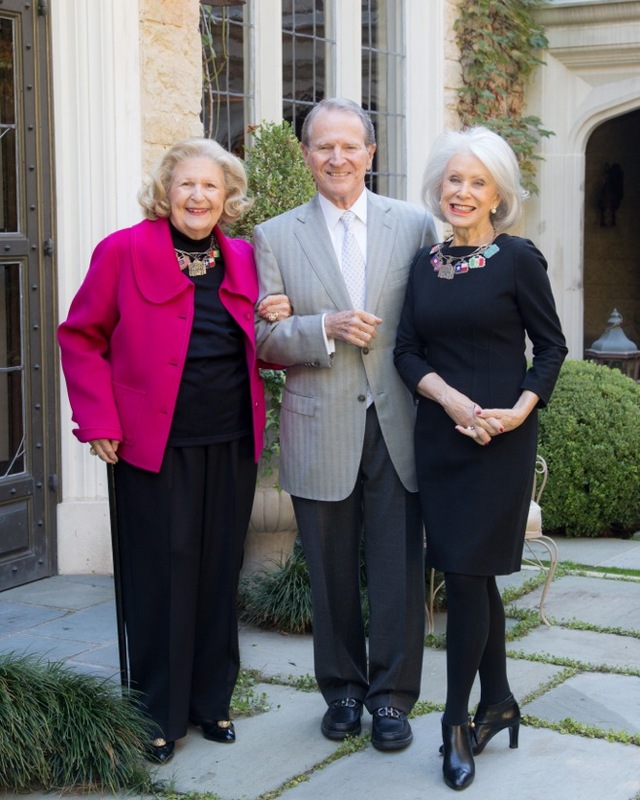 It was in this spirit of celebration that they asked our founders to serve as La Fiesta Honorary Season Chairs – Lindalyn Adams, Pierce Allman and Jennie Reeves. In 1985 these three unlikely partners came together to lead efforts to save the oldest house in Highland Park. Experiencing a budget shortfall, Lindalyn, Pierce and Jennie had to quickly pool their resources to find a way to raise the money to preserve the home and move it to Old City Park. Inspired by the upcoming Texas Sesquicentennial, they dreamed up the idea of hosting a community-wide fundraising celebration, a fiesta, based on Texas historical tradition. The first La Fiesta Gala was held in Highland Park Village. Six Duchesses representing families of Highland Park and University Park were presented in historically accurate gowns representing the six flags of Texas. Response was enthusiastic! Park Cities citizens who had served many good causes in Dallas realized it was the right time to serve their own community. Little did Lindalyn, Pierce and Jennie know that this neighborhood benefit would evolve into the La Fiesta of today – an organization of hundreds that honors forty Duchesses and forty Escorts, supports fifteen beneficiaries and has raised over seven million dollars for the Park Cities! These three amazing individuals are true pillars of our community, leaving a legacy of generosity and tradition that continues to inspire and influence the Park Cities. We were honored to have Lindalyn, Pierce and Jennie participate in the 30th annivesary festivities as our Honorary Season Chairs. Their passion, talent and friendship are the reason we have La Fiesta today – and that was truly a cause for great “¡Celebración!”.